Stainless steel has a timeless, elegant look that fits any d cor and looks beautiful in any setting. A stainless steel kitchen sink is durable, easy to keep clean and disinfect, and will only grow more beautiful with age if you take proper care of it. Stainless steel sinks are made from stainless steel made with nickel. The finish is usually satiny and smooth rather than chrome-shiny. Stainless steel is tough it resists rust, chipping, nicking and cracking. It won't stain or fade or discolor. It's easy to clean with a household cleanser, and believe it or not it helps protect glasses and dishes from breaking if you drop them. With that much going for them, it's no surprise that stainless steel is the most popular material for a kitchen sink. Despite all that, though, there are a few things that can damage your stainless steel sink. Problem: Chlorides that are used in most soaps and bleaches these days can eat away at the steel. Solution: Rinse sink well after each use. Solution: Some scratches are natural and will blend into the sinks finish. You can avoid the worst of them by avoiding the use of steel wool on your sink. Instead, use a soft scouring liquid (Soft Scour) to avoid scratching the finish. Problem: Hard water can leave stains or wear on the finish. Solution: Wipe the sink dry after use, and clean it thoroughly once a week. Problem: Salty foods can damage the stainless steel finish. Solution: Always rinse your sink thoroughly after using it. - Clean the sink with soapy water, or a stainless steel cleaner (Spray N Sheen Stainless Steel Cleaner/Polish/Protectant) once or twice a week. - Disinfect the sink surface regularly with an all purpose disinfectant, remembering to leave the solution on for the recommended length of time. - Don't use your sink as a cutting board. A knife can leave deep nicks or scratches that may rust and destroy the sinks finish. - Once or twice a month, fill the sink half full with a 50/50 solution of bleach and water or a special stainless steel cleaner (Stainless Steel Cleaner). Let it soak for about 15 minutes, then wash the sides and bottom and let it drain. Remember to wipe dry when done. - Scour in the direction of the finish lines. Scouring across them can damage the finish. - Don�t let liquid soap or other cleansers dry on the sink. Rinse well and towel dry. Caring for your stainless steel sink properly will ensure that you get years of life from it. Just remember, wash regularly, disinfect daily, polish weekly and dry after every use. Professional Remodeler magazine has recognized PremierGarage's newest cabinet offering as one of the 50 Most Innovative New Products 2008. The new garage cabinets, called PremierAccess, feature a by-pass sliding door system, which reflects the program's goal to applaud technological advances in the residential building market. The term "satellite kitchen" conjures many definitions. Is it a kitchenette in a casita or guest suite, a coffee bar in a master suite or a fully appointed outdoor kitchen? Perhaps it's simply a convenient place to store and serve snacks in a home office or theater room, or a complete kitchen geared to casual entertaining in a game room. To help sort out the design issues for the various types of satellite kitchens, we turned to Linda Leach, ASID, IIDA, CID, of Trinity Bay Interiors in Newport Beach, CA. Check out her design tips for a successful satellite kitchen. GreenPlumbers has recognized Caroma, an Australian manufacturer of high-quality, water-efficient bathroom products, as a premier partner in the United States. "Protecting the environment is critical for the sustainability of our natural resources, and preserving water, the most valuable resource, is a growing concern," said Derek Kirkpatrick, Caroma's North America manager. "Our partnership with GreenPlumbers helps us spread the word that water conservation is easy with just the touch of a button." CompanionCabinet Software, LLC, maker of a cabinet distributor-focused software package that enables customers to sell more kitchens without adding additional staff, has launched the Learning Center, an online knowledge base of best practices for cabinet dealers. Marvel, manufacturer of luxury undercounter refrigeration products, was recently awarded the Consumers Digest Best Buy rating for its Chateau Collection 54-Bottle Wine Cellar, model 6SWCE. Consumers Digest defines Best Buys as products that offer the most value in a given price range, are available nationally and merit special attention from consumers based on a combination of performance, ease of use, features, durability, warranty, efficiency, styling, and maintenance and servicing requirements. EarthSource Forest Products, the Bay Area's oldest and largest supplier of sustainable lumber, celebrates its 25th anniversary this month. EarthSource, formerly Plywood And Lumber Sales Inc., offers sustainable lumber and panels certified under the standards of the Forest Stewardship Council (FSC), and was one of the country's first wood products distributors to receive chain-of-custody certification by the FSC third-party certifier SmartWood, a program affiliated with the Rainforest Alliance. Since its inception, EarthSource has grown to become one of the largest distributors of green wood products in North America. RangeCraft Manufacturing has completed what is believed to be the world's largest copper island range hood. Manufactured for residential use, this custom hood measures 126 in. wide by 92 in. deep by 45 in. high. It is constructed from hand-hammered antique copper with smooth antique copper tiles. Hood features include trims and crown molding in non-directional stainless steel. For American Woodmark Corp., net sales for the first quarter of its fiscal year 2009, which ended on July 31, declined 16 percent as compared with the first quarter of the prior fiscal year to $139 million. The decline in sales to the company's remodeling and new construction customers each approximated the overall decline. In this installment of Designer Roundtable we asked designers around the country, "Do you often use wallpaper in your bath projects? If so, where and how? If not, why not?" In a turbulent building market, can a cabinet dealer stay the course and shift focus at the same time? Although doing both may sound impossible, you can maintain your core business expertise while widening your offerings and your market focus. The key is to redirect your attention in ways that capitalize on your business' core strengths. Remember, shifting focus is by no means changing focus. Following is a look at moving into the remodeling market, as well as some key considerations to keep in mind in these challenging times. Although fairly durable, care must be taken around glass sinks. If a glass sink is chipped or cracked, it cannot be glued back together. The whole unit must be replaced which can be expensive. - If water is too hot to touch, it is too hot to be in your glass sink. Extremely hot water will cause the sink to crack or shatter. If you take care of your glass sink, it will continue to add style and elegance to your bathroom for many years. Shopping for a copper sink can be confusing. In this article, plumbing industry veteran Jack Healy will guide you through the maze of information and help you select the right sink for your project. You will learn some new terms like "living finish" and "metal gauge". Arm yourself with information before you buy! Selecting a kitchen or bathroom sink use to be easy. There were just a few large companies selling ceramic, enameled steel, cast iron and stainless steel sinks. In the past decade, there has been an explosion of new products in the sink category and a growing demand for hand crafted and custom work. There have been several “new” sink mediums gaining recent acceptance – glass, various stones, brass, copper, and even wood. 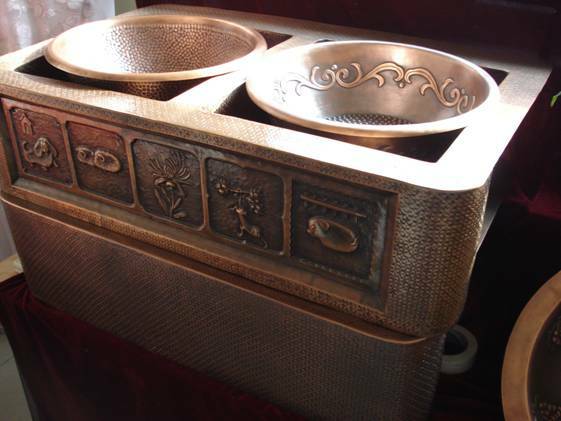 This article will focus on copper sinks and what to look for before making your purchase. Copper is man’s oldest metal, dating back more than 10,000 years. Its use in the home in modern times ranges from copper tubing in your plumbing system to some of the finest cookware available. Restaurateurs, hoteliers and interior decorators look to copper and brass as naturally inviting metals that make a statement of quality, comfort and beauty. It is no wonder that copper has also become a popular material for sinks in the kitchen, bath and bar. Copper artisans abound throughout the world, however the artisans that have gained a reputation for making sinks has been primarily centered in India, Mexico and the US. Most of the shops making “hand crafted” copper sinks are small and the methods used to construct sinks goes back centuries. The term “hand hammered” has recently become synonymous with Mexican sinks. This term refers to the original ancient techniques that artisans have been using for centuries in this area. Copper sheets are literally hammered into shape and hand finished. The results are somewhat rustic, but truly unique and one of a kind. Copper sinks in the US are made with similar techniques but are more often “smooth” rather than “hammered”. US copper craftsmen are dominated by shops doing custom work primarily for commercial projects such as restaurants. When considering a smooth surface copper sink, be careful if it is for the kitchen or prep area. Smooth surfaces will show scratches and dents much more than a hammered surface which is a consideration if you are using the sinks to wash dishes, pots & pans, etc. In addition, the hammered surfaces are stronger than smooth surfaces and hold up better in the demanding kitchen environment. There are three primary differentiators determining quality of copper sinks – construction technique & quality, copper thickness and the company you are buying from. Construction technique is made up of several factors - how corners are constructed, welding technique and proper dimensions for ease of installation. When considering sinks with welded seams (generally larger kitchen sinks require some seams), make sure they are TIG welded using copper rod (“copper welded”). If not, the seams will eventually turn “grey” and possibly leak. We have seen copper sinks that have improper drain holes resulting in a gap between the drain escution and the sink bevel. Another potential problem is if the sink is “out of square”. This can result in big problems at the time of installation. Some bending of flat rims is OK and quite common (and easy to rectify at the time of installation) but square or rectangular sinks that are uneven will generally require a replacement. The company you are buying from should offer a warranty against such defects and stand behind their product. The quality of the copper sink is made up of several factors – some aesthetic and some potentially harmful. Quality can vary even when considering sinks made in the same town such as many of the sinks from Mexico. Insiders refer to different quality levels as “firsts”, “seconds” and “defective”. Remember, these sinks are handmade one at a time by artisans with varying levels of skills and experience. Like any artisan crafted product, there can be varying levels of quality. At Copper Sinks Online, we only sell first quality products and leave the seconds to other companies selling on auction sites such as eBay or direct from Mexico. We recognize that this might mean a potential price difference, but we prefer to protect our reputation and ship only product we would be proud to install in our own homes. Copper sinks should be made out of pure copper. Pure copper naturally posses Antimicrobial properties to prevent germs and bacteria from surviving on the surface of raw, unsealed copper. At Copper Sinks Online, are sinks are made of pure reclaimed or ASTM 187 B copper laminate. A growing concern of ours is the use of copper alloy containing lead – specifically in sinks from the Middle East and China – to reduce the costs of manufacture. Lead has similar workability properties as copper and is quite inexpensive, but it is not meant for human consumption! We can assure our customers that our genuine hand hammered copper sinks from Mexico are not made of these lead containing alloys. Another quality factor to consider is the patina process used to artificially age the copper from a bright copper to a darker, warmer look. The widely accepted method for sinks from Mexico (including those made in our factory) utilize heat to patina the surface of the copper. Sinks from other countries are oftentimes using chemicals to “coat” the surface using harmful chemicals. These sinks are often lacquered or sealed to maintain the patina. Why is this not good? The lacquer used will wear away unevenly and in a short time the copper below will be exposed. This results in a very uneven surface. Be very cautious when buying a copper sink that any type of lacquer sealer is not used. The thickness of the copper used in the construction of hand hammered copper sinks varies greatly between factories – even those in Mexico. Copper is a soft material and the thickness – even just a few points – can have a dramatic effect on how well the sink wears over time. Gauge is a physical measurement of the thickness of the copper and is sometimes referred to by the weight per square foot. The thicker the gauge copper, the lower the number. Most bath sinks are made from 20 gauge (the thinnest) to 16 gauge (the thickest) and most kitchen sinks range from 18 gauge to 14 gauge. When shopping for copper sinks, always ask about the gauge and be aware that a thicker gauge sink will cost more – and in most cases is worth it! A lightweight gauge metal can result in a “tinny” sound when running the faucet. It will dent easier (a big consideration for a kitchen sink). Although it costs much more, our sinks are only made with the thickest gauge copper available. 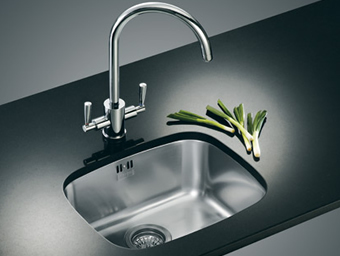 Our kitchen sinks do not need sound insulation because they are not made from the thinner gauge copper we see being sold by most of our competitors. Finally consider the store you are buying from. If a copper sink seems “cheap” in price, there is usually a reason. 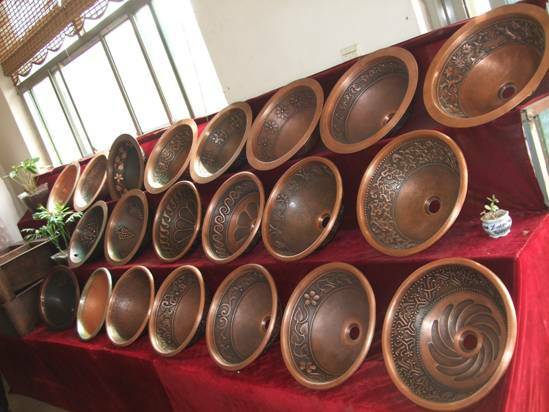 I have seen many of the copper sinks sold on the most famous “auction site” . All I can say is “buyer beware”, or more to the point “you get what you pay for”…. If something goes wrong with your sink or there is a problem when it arrives, you want to make sure the company you purchased from will stand behind their product. Think carefully about buying internationally. Too often, a sink that is received isn’t as represented. A reputable dealer should identify their shipping location, clearly state their warranty and return policy and be available for consultation. I am a fan of copper sinks. I think they are rugged yet elegant – especially as they age. The rich highlights and undertones of the patina process are constantly evolving. A copper finish is a “living finish” and never really stops changing in color. That being said, the evolution of a copper finish is gradual, and as it ages it becomes even more handsome. You can greatly reduce this change with the use of wax , but personally I like to let the copper evolve. Most often this process results in a mellow brownish weathered copper patina. I like to refer to it as the basins soul. Copper sinks often come in various finishes from a bright copper finish (like a new shiny penny) to a dark patina (we call ours “Dark Smoke”) and everything in between. The copper finish you choose is a matter of personal taste, but oftentimes our clients prefer the more “weathered” patinas to avoid the upkeep or uncertainty associated with shiny copper. If you want to slow down the patina process, try applying a wax like “Renaissance Wax”. Applied every few months, the wax will provide a barrier between the copper and the environment. Copper sinks for the kitchen come in two basic forms: Under Counter Mount or Farmhouse style. The rustic nature of copper sinks lends itself well to the farm sink style. Sometimes referred to as “apron front” sinks, these sinks come in a variety of sizes, shapes and with different configurations – i.e. single bowl, double bowl and even triple bowl. 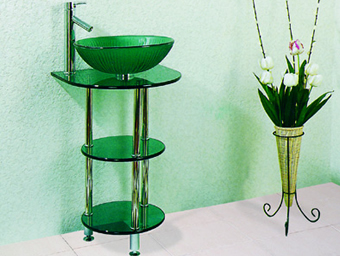 Bath sinks are generally available in three styles: vessel (above counter mount), “drop-in” or under counter mount. Usually the lip style determines whether the bath sink is a drop in or undermount. Be sure to order the proper lip style to accommodate your project.